Synopsis (From Goodreads): The Undying: SHADES finds American student Jeanie and her young charge, Ren, fifteen years after the EMP that wiped out Paris and sent them on the run from the undying. Walking the highways and hiding out in abandoned buildings across France, they eventually find their way to Spain and the walled city of Ronda where a few dozen survivors have gathered—safe enough from the hunting undying, but facing a new threat on the scorched planet: starvation. My Thoughts: I just realized that I didn’t post the review for the first book. Whoops. Oh well, I’ll get on that. I’d give the first one 4 stars, if that helps! 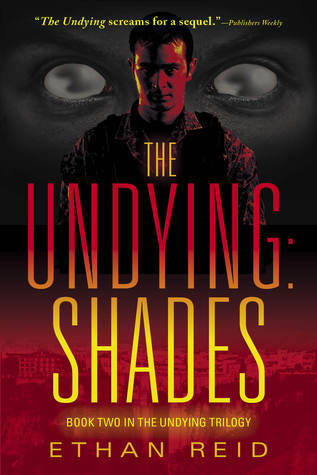 The Undying: Shades picks up where The Undying left off…plus quite a few years. I really enjoyed the first book and I was interested to see how the main character and mini-main-character were shaped by the new world. This most recent book does answer that question, and the story itself is good, but I wish it had just a touch more suspense built in. One of the major themes in this book of the series is supposed to be starvation. While there’s mention of lack of food, so yes you do get told that everyone’s hungry in this particular place, there’s also the distinct notion that builds that if folks would simply man up and get off their tushes, there’s plenty of food to be scavenged, still. Anyhow, that’s not a make or break sort of thing, for me at least. I continued to read til the end, and if there was a 3rd I’d read that, too. I am glad I have the series in eBook format, though, and not taking up room on my shelves. It’s just okay. Do you know how to make your site mobile friendly? My weblog looks weird when viewing from my iphone 4.